My alarm goes off at 8:45 but I hit snooze. I never go to bed early so waking up before 11am usually doesn’t happen and if it does it’s a struggle. Not to mention that I now need 11 hours of sleep. I get out of bed 15 minutes later and get ready to go to the hospital. My mom is downstairs and has made French toast for me (she’s been great through this). I grab some water to take with me. 10am we’re out the door. My mom’s driving … Wed afternoon parking is always difficult so I usually go in while she finds parking. I’m at the hospital now, I check in and fill out the weekly assessment before seeing the Dr (radiation oncologist or his fellow). I see the dr every wednesday. My mom is with me and I get called in. The usual dr that sees me isn’t there and I see another ‘fellow’. She comes in and says hi, and then rolls her stool over to my mom and asks how she’s doing. She just assumed my mother was the patient! Do I look that young? Did she not look at my chart? Did she think my mom was 43? Whatever happened she had no comeback. She could have just said she thought my mom looked young or I couldn’t possibly be 43! Haha. Anyhow she was embarrassed and we continued with the appointment. She asked how I’m doing and examined the radiated area. I’m doing fine, some redness and sensitivity but otherwise ok. Moral of the story … Never assume. We now go back out into the waiting area and I scan my card to let the radiation therapists know I’m here. My room is on schedule. Unit 15 is where I go everyday and switch between the same few therapists. They’re all very nice. 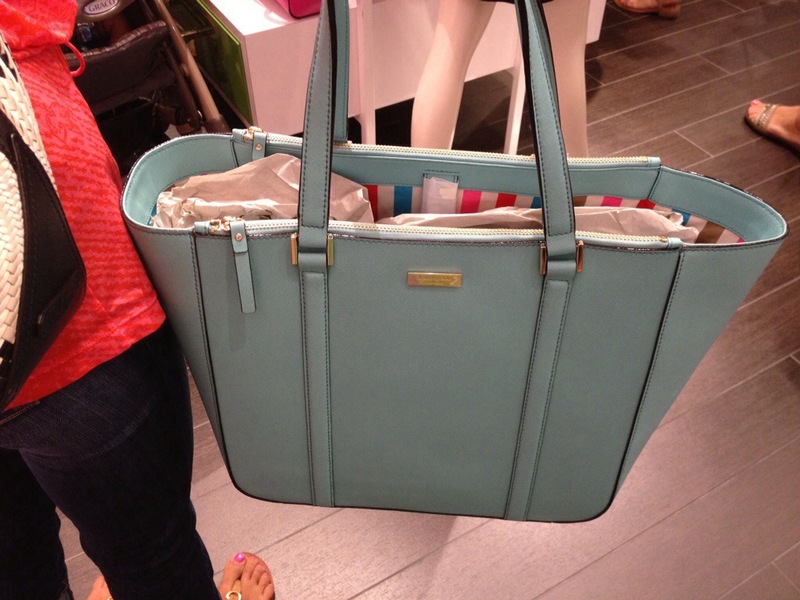 I get many compliments on my Kate Spade light turquoise bag. Bought it in August shortly after diagnosis. My cousin and I went shopping. Fun! The bag is my perfect hospital bag as there is nowhere to put my clothes when I change into the gown for radiation (annoying but whatever). So my bag fits my clothes and I love the spring happy colour of my very roomy bag. It’s a great tote and I love it!! The radiation therapist now calls me in. I change into the robe and wait for them to call me in. Once I’m called in they ask for my birthday to confirm. I lie down but there is a fold on the table which ends up being right at my tailbone. Ugh. So we put a folded sheet underneath (everyday). I lie down and everything including me is being adjusted. The lights go off and there is a panel above me. One of the two techs comes over and asks me to take a deep breath and hold and takes some measurements. I can see a ruler like image on my chest in the reflection above. She takes a few more measurements and then puts the nose clip on, puts the snorkel in and gives me the emergency button. My right arm is down holding the button and left arm is up. I’m semi comfortable minus the nose clip. Now it begins with a panel moving into position on my right. I hear “first breath in, breathe out, second deep breath in” and now I hold my breath until I hear “breath normally”. Although I couldn’t breathe if I wanted to since the snorkel is attached to some sort of device and my air is cut off when I’m holding my breath. After that this happens a few more times as the panels move around me. They come back in and take a few more measurements, then leave and we repeat the process. Then I hear “you’re all done”. I sigh with relief … Until tomorrow.